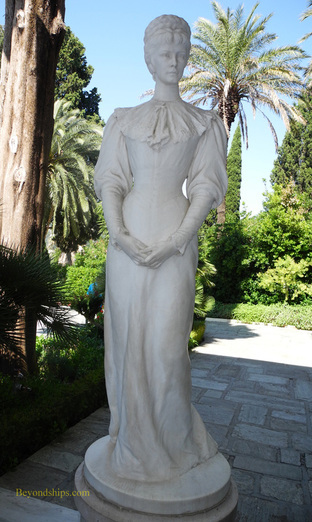 Above: Empress Elisabeth of Austria (known as Sissy) conceived the idea of the Achilleon Palace. 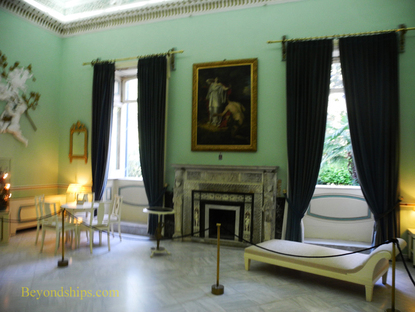 Much of the interior of the Palace has been restored to look as it did when Sissy and/or the Kaiser lived here. 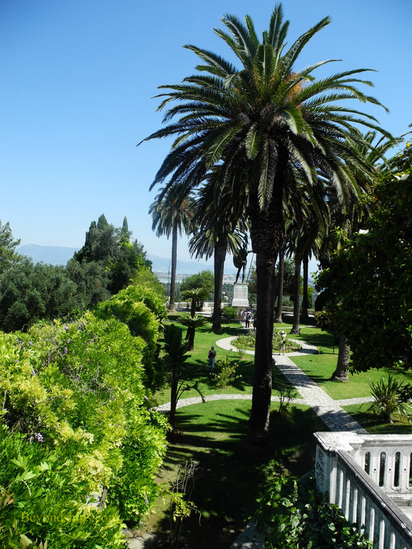 Above: The formal gardens at the back of the house. Below: The Kaiser placed the statue of the Victorious Achilles (below left) at the panoramic overlook at the end of the garden. It displaced the statue of the Dying Achilles, which had been placed there by Sissy (below right). But if one is looking to escape from the modern world, it is easy to do so. 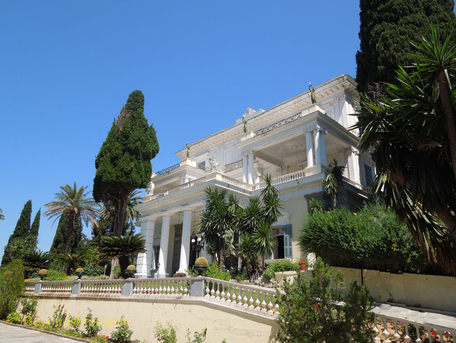 Not far outside of town (6 miles) is an idyllic spot, the Achilleion Palace. 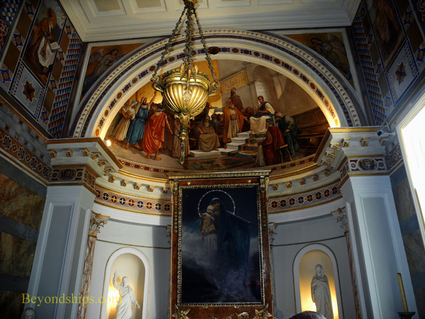 Built in 1892 by Empress Elisabeth of Austria-Hungary, this beautiful spot has a rather melancholy story. Sissy, as she was known to her friends, was the daughter of the Duke of Bavaria. A marriage had been arranged between her old sister and her cousin Franz Joseph, who was to become the Emperor of Austria-Hungary. However, when Sissy and Franz Joseph met, they fell in love and so Sissy became the bride. Together, they had four children. From this romantic beginning, the story turns south. One of Sissy's daughters died of natural causes and her only son committed suicide. Her relationship with Franz Joseph deteriorated. She began to travel, spending little time at court in Vienna. At the same time, she became very concerned about keeping fit. She would exercise up to five hours a day and would eat very little. The paintings and photographs show that she had a remarkably tiny waist at a time when full-figured women were considered the ideal of beauty. One of the places that Sissy liked to visit was Corfu and so she decided to build a home there. Her father had been very interested in Greek mythology and Sissy had inherited this interest. Accordingly, she dedicated her new home to her favorite figure from Greek mythology, Achilles, one of the heroes of the Trojan War. The architecture and the décor recall Ancient Greece. Although Sissy's home is called the Achilleion Palace, it is more the size of a country house than of a palace. It successfully avoids the heaviness of most mansions of that era, largely because of its use of the neo-classical rather than Gothic revival in its design and decoration. Sadly, Sissy did not get to enjoy her home for very long. One day when she was walking beside Lake Geneva in Switzerland, an anarchist handed her a bouquet of flowers and as she accepted them, he stabbed her in the heart. The next owner of the Acilleion Palace also lived a life out of a Greek tragedy. Kaiser Wilhelm II of Germany was born to rule one of the richest and most powerful countries of the late 19th and early 20th centuries. However, his left arm was injured at birth and he became extremely sensitive about his stunted arm. Throughout his life, his actions often seem to be motivated by a desire to prove himself equal to or better than other men, particularly his uncle King Edward VII of Great Britain and later Edward's son King George V. This, of course, was to have tragic consequences for the entire world. After his abdication at the end of World War I, the gods gave the exiled Wilhelm years to brood upon his failure and lost glory. While Sissy had recognized the tragedy in the Achilles legend, Wilhelm saw only the marital glory. 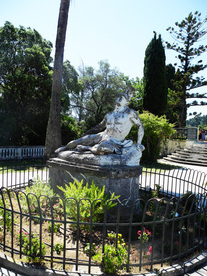 When Sissy owned the Palace, the statue of the dying Achilles was the centerpiece of the gardens. 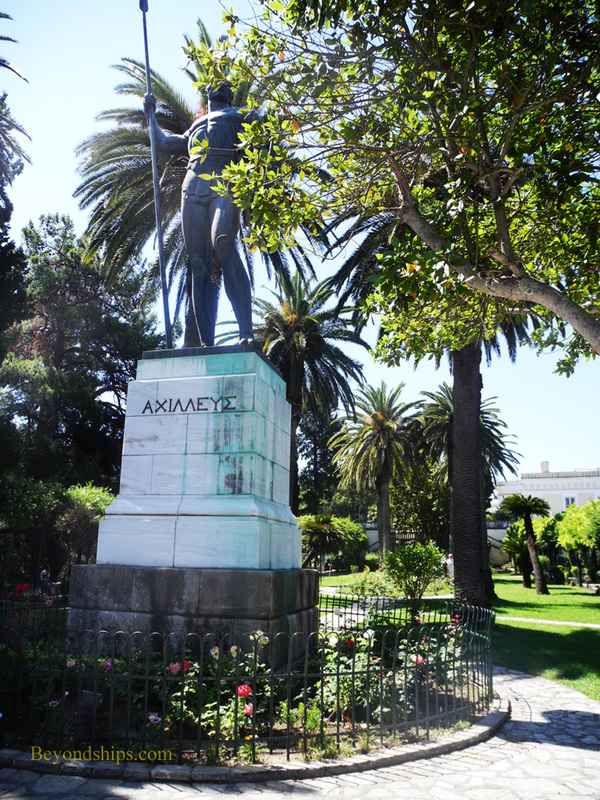 Wilhelm had that statue moved and in its place, he erected a giant bronze sculpture, the Victorious Achilles. Standing upright and proud, the muscular figure holds his spear and shield. Did Wilhelm ever realize that it looks entirely out of place in this peaceful and serene world? It ominously portends tragedy. 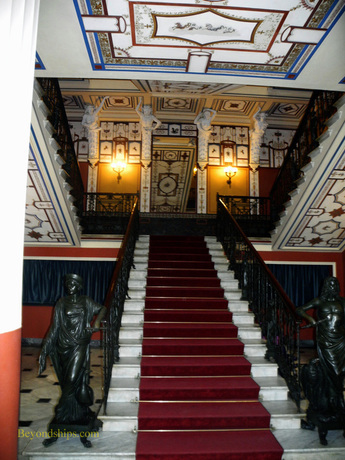 You may well have seen the Achilleion Palace. It was used as a set for one of the James Bond movies “For Your Eyes Only.” By then, it was no longer a residence but the fact that it was selected to be the backdrop for one of the glamorous spy tales testifies to its ongoing elegance. Of course, the Achilleion is something of a fantasy land. It was built as an escape from reality. The elegant house was designed to transport the occupants into the world of myth and legend. It is set in a formal garden, which is by definition something apart from nature. On a sunny day with the blue Ionian sky overhead, it can still sweep you away to another, albeit melancholy, world. 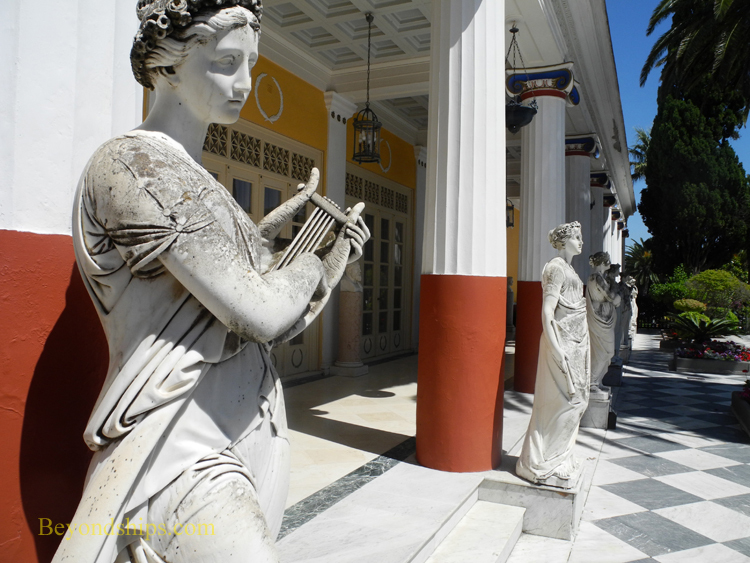 Left: Statues of the muses grace a colonade leading out onto a patio.